See the diverse yet equally breathtaking cities and natural wonders that Australia has to offer with cosmopolitan Sydney, the Red Centre at Uluru, Kings Canyon and Alice Springs & then onto Cairns and journey an hour north to Port Douglas, the gateway to an amazing selection of touring options encompassing the Reef, the Outback and the Rainforest. While at Uluru, take in the limited time only Field of Light art installation by internationally acclaimed artist Bruce Munro. See 50,000 slender stems crowned with frosted-glass spheres that will bloom as darkness falls over Australia’s spiritual heartland. Package from pricing is based on double occupancy (2 people sharing a room) for travel Sunday - Wednesday 08 April – 30 November 2017 for purchase by 15 February 2018; $60 supplement applies each way for travel on Thursday to Saturdays. Ask an Aspire consultant for pricing for other travel dates. Add-on fares are available from other cities. Certain blackout dates apply on the accommodation and tour value add offers - check with your Aspire consultant. Seats are limited and may not be available on every flight. Hotels are subject to availability. All prices reflect a discount for purchases made by cash/wire transfer/check, please see terms and conditions for credit card payments. There are no discounts for payment made by credit cards. Cancellation penalties and other restrictions apply. 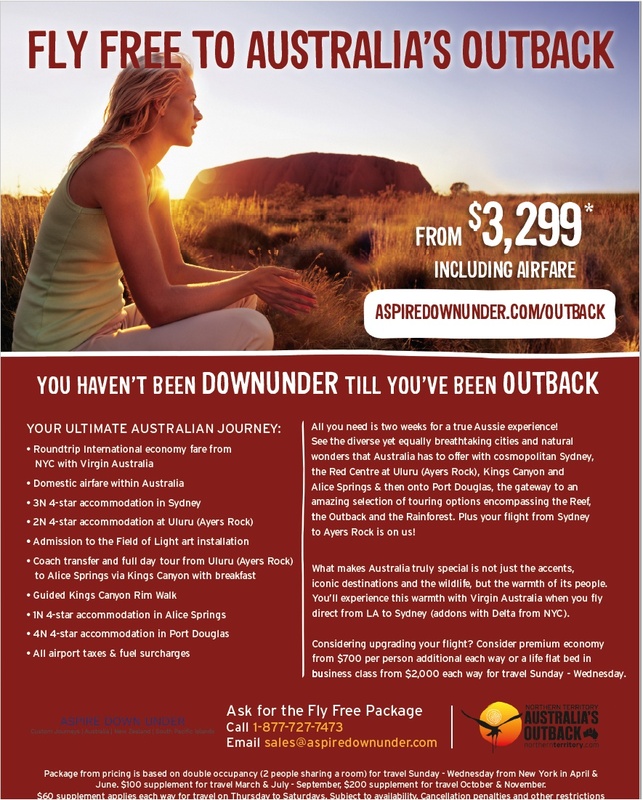 A passport with extended validity past your travel dates and an Electronic Travel Authority (ETA) is required to enter Australia; Aspire Down Under can issue your ETA for a processing fee of $25 per person. A copy of the picture page of your passport and payment for your ETA is required at the time of booking.